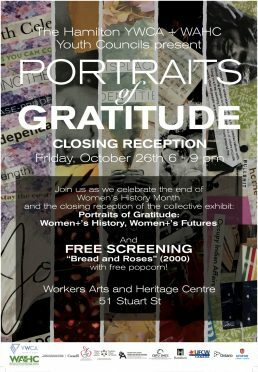 Portraits of Gratitude: Women+’s History; Women+’s Future is a community art exhibition showcasing the work of artists from WAHC and YWCA Hamilton’s Youth Councils. Please join us for the public closing reception on October 26th from 6 pm – 9 pm followed by a screening of the film Bread and Roses. This exhibition is in honour of Women+’s History Month and celebrates the brilliant, creative and powerful stories of Women+ who have changed our worlds and minds. Through a collaboration between the YWCA and WAHC Youth Councils, we invited collage artist Stylo Starr to help us visualize our gratitude to the women+ who influence and inspire our lives, labour, and activism in significant ways. The collective images of notable women+ in leadership and figures of women+ as matriarchs reflect the deep impact they have on the lives of our emerging generation and hope for their futures. This presentation was created through a partnership between WAHC’s Youth Council, the YWCA Youth Advisory Council and is generously supported by Ontario Trillium Foundation, the Government of Canada, the City of Hamilton, Canada’s Building Trades Union, UFCW, HWETL-ETFO, UNIFOR, and the Ontario Arts Council. Thank you also to CUPE Local 5167 for lending their popcorn machine for the film screening. For questions or more information, please contact Outreach and Partnerships Coordinator, Jordyn Perreault-Laird at jordyn@wahc-museum.ca or 905-522-3003 x 21.